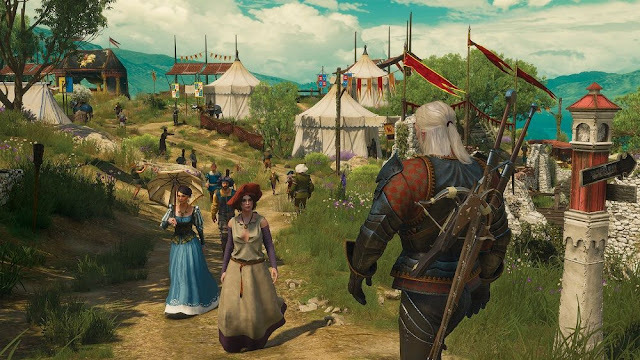 Blood and Wine (a literal title, describing what this expansion entails, Vampires and Vineyards) presents a world to Geralt that is a stark contrast to the gritty and dark realm of the Northern Kingdoms. In the first quest given to the Witcher, the player is reminded of the brutality that both the men and women in these quaint little villages endure day after day. Male soldiers can be sliced open from attacking bandits, where female villagers can be raped and left to die. Related reading: Matt's review of The Witcher 3's original release. This grim, medieval setting is a world away from Toussaint, the French influenced duchy below the Nilfgaardian Empire, which is almost fantasy set in reality. Toussaint is exotic to say the least, ruled by Duchess Anna Henrietta, who offers Geralt a contract to find and kill the monster responsible for murdering knights of Toussaint. The Duchess is everything that Toussaint isn’t. At the drop of a hat she would rather take off her dress and mount a horse to ride off and try to rescue one of her knights. A true leader, something comically portrayed by her service worrying over her silk rather than her welfare. A fair way into his journey, Geralt becomes the owner of Corvo Bianco, a vineyard in the heart of the Toussaint region. Corvo Bianco is Geralt’s bachelor pad if you would, a location that can be upgraded as the game progresses, and while most of these features are purely cosmetic, such as being able to display your armour sets, it’s a nice addition to have included. Some of these sets take time to produce and it’s something proud for players to show off, even if it is meaningless. The main questline of blood and wine explores the concept of virtue. On the outside, Toussaint and its capital Beauclair, seem like it would fit in a fairy tale, the values of the people who live within are nothing like those in the rest of the Northern Realms. 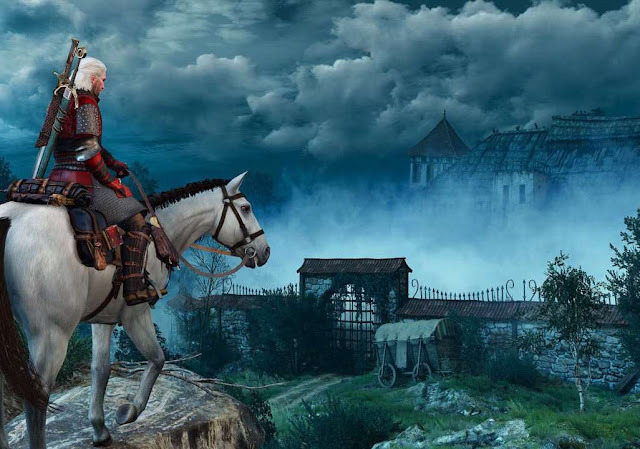 By night however, the streets are filled with secrets of devious deeds, with many of its residents using Geralt to assist them in solving their problems. A foul beat has murdered knights tasked with protecting the duchess, who have all in one way or another violated the five virtues that the knights of Toussaint swear by. You start to question the world that Geralt resides within. The opening moments of the expansion seem to tell a different story, one of idyllic knights fighting for their duchess’ admiration. Folly sure, but commendable, heroic, nothing like the virtues that have been violated by the murdered knights. Additionally Blood and Wine introduces Mutation, an advancement of the Mutagen system. Mutations are additional and powerful abilities that can be equipped to Geralt to make him more powerful. These mutations, much like the mutagens, can craft Geralt to how the player plays. If he is primarily a swordfighter, the Deadly Counter or Bloodbath mutations are perfect, where players that lean towards signs might find more enjoyment out of the Piercing Cold or Conductors of Magic mutation. It’s a system that provides enough alternatives to the gameplay style for returning players, making it easier to attempt the more difficult settings, yet is still simple enough for new players to get a grip of and understand. There are also additions to everyone’s favourite card game Gwent, with a brand new deck being added. The Skellige deck is collected through a Gwent side-quest, which offers new cards upon completion of each quest. I loved Gwent, I spent hours playing it in the main game and so I’m happy that CD Projekt Red wanted to put more effort to tie up the game in all areas. Furthermore, Blood and Wine surprisingly adds a lot of new content. There are 90 new quests, and 40 points of interest and that should supply roughly 30 hours of new content. There is also now a Dynamic Point of Interest system, which will change the game world when you clear points of interests. Clear a monster nest, there will be significantly fewer monsters in the area. A subtle yet noticeable change. 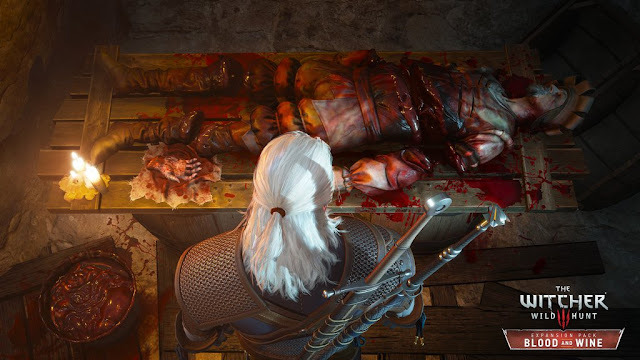 The Witcher 3: Wild Hunt was already a very solid game. Nearly everything was done right making it one of the best adventure RPGs available today. Normally add-on content doesn’t change the game that much, making it somewhat forgettable. Here I would make it a prerequisite to anyone starting the game fresh. What it adds to the Witcher is something very special. Everything clicks, like a well-oiled machine.